Learn to smoke your own cheese, fish, meat and more! We recently filmed a short piece on 'life after downshifting' for the One Show. 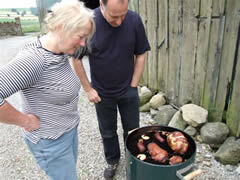 The BBC were very interested in the lifestyle we have managed to create since we downshifted to run a smokehouse and the fact that we now run courses teaching people how to smoke their own food at home. We thoroughly enjoy our lives, we work from home, we run courses and we get to meet really great people. We also have a portfolio of income streams which give us just enough money to live on - but more importantly give us a great quality of life. One of our other income streams is running Stepping Off where we help people change their lives, downshift, start again and generally begin to enjoy their life more. So catch us putting Carol Thatcher through her paces to catch a trout, make her own recipe sausages and learn to smoke food. Shelley Riddell who runs Bessy Beck with us in the background fly fishing. Stepping Off and soTraining and Consulting. Corporate training, specialising in designing and delivering motivational seminars and workshops. Our work is motivating and inspiring, putting your organisation a step ahead. And why not Smokey Joe's? Or Smoky Joe's? Or even Smokey Jo's?!! Learn to smoke food with Smoky Jo's. are available for next year's courses. 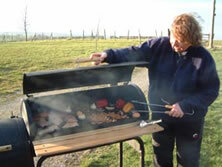 Read what our customers have said about the Smoky Jo's experience! What are you smoking today, Jo? Here we have - chicken, salmon, sausages, peppers, mushrooms, prawns, cheese, garlic, eggs and nuts! 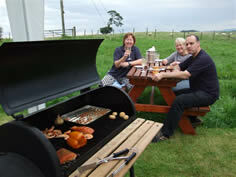 here we are tasting some of the days smoked food, all washed down with a glass of fizzy! Smoked pheasant, sausages and mushrooms on the water smoker. Fed up with your Life? Are you in a rut? Do you dream of a different future?